An investigation into the death of a California weapons hoarder whose decomposing body was found in a car last week has taken a bizarre turn as it emerged that the man’s fiancee believed he was a part-human, part-alien creature who was sent to earth to save humanity while working as a secret agent. The remains of 60-year-old Jeffrey Alan Lash were discovered last Friday in a parked vehicle on Palisades Drive in the Pacific Palisades. 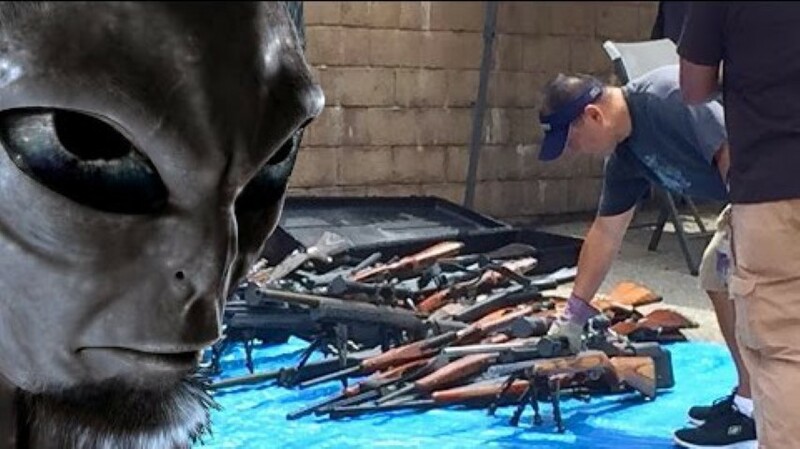 When Los Angeles police searched the home of Lash’s fiancee, Catherine Nebron, they came upon more than 1,200 firearms valued at nearly $5million and more than 6.5 tons of ammunition. Initially, Lash was described by a family friend simply as a weird ‘loner,’ but on Wednesday, the already bizarre tale had a new, otherworldly twist to it. It appears the 60-year-old gun collector had convinced his fiancee and her employee, Dawn VadBunker, that he was a human-alien hybrid working undercover on behalf of secret US government agencies. VadBunker’s worried mother, Laura VadBunker, told KTLA that the family had become increasingly worried for her state of mind, especially after having spoken to her. ‘It’s worse than a Twilight Zone movie and we’ve lived through hell,’ Laura VadBunker told KTLA over the phone in reference to the odd case. Lash collapsed July 4 in a Santa Monica parking lot in front his fiancee and 39-year-old Dawn VadBunker. The man had trouble breathing but refused to be taken to a hospital. The two women attempted to help Lash, but the 60-year-old died. Instead of alerting the police, Nebron and her personal assistant loaded his body into an SUV parked in the 17000 block of Palisades Drive and left for Oregon. It was not until two weeks later that an attorney representing Nebron called police and told them about the decaying corpse. Defense attorney Harlan Braun said both Nebron and VadBunker believed Lash was a secret agent of extra-terrestrial origin who had been tasked with saving the human race. Nebron told her lawyer she did not contact police about Lash’s death because she thought his handlers in the CIA or another intelligence agency would come and pick up his remains. On July 10, a week after she was last seen heading to work in Santa Monica, Dawn VadBunker’s mother reported her missing because the 39-year-old mother of two took off without telling anyone. As of Thursday morning, Dawn VadBrunker has not returned from Oregon, but she did send her mother a letter apologizing for making her family worry for her. Mrs VadBunkers believes her daughter may be in the throes of a mental breakdown and wants her to come home to her teenage daughters and seek treatment. LAPD Deputy Chief Kirk Albanese told The Los Angeles Times Jeffrey Lash’s cache appeared to be a private collection and that there was no evidence that he was selling the weapons or was a licensed firearms dealer. Many of the guns had never been fired and some still had their price tags attached. ‘There are a lot of expensive guns here,’ Chief Albanese told The LA Times. Harlan Braun, Nebron’s attorney, said police also seized a number of SUVs modified for use on different types of terrains, including an amphibious vehicle, and $230,000 in cash. Shirley Anderson, the longtime partner of the Lash’s late father, said she hadn’t heard from Lash in five years. She was called by the L.A. County coroner’s office last week and told that a body had been found and it was believed to be Lash. Anderson said that Lash, the son of a microbiologist, was set to follow in his father’s footsteps and enrolled at UCLA in the 1980s to study to be a scientist. However, he dropped out, and not much is known of his life after that, Anderson said. ‘He was just a loner, as far as we were concerned,’ the 93-year-old said. Anderson said she did not know Lash had a fiancee. She also didn’t know he collected guns, but said he would often go to gun shops. ‘He was not very forthcoming about what he was doing,’ Anderson told the newspaper. Officers said that they needed two trucks to remove all the guns to a safe location. Commander Andrew Smith confirmed the arsenal included rifles, pistols and shotguns. The cause of his death has not yet been determined but it is not being treated as homicide. Detectives want to find out why he had so many guns and are examining the weapons to determine if they have been linked to any crime. Cdr Smith continued: ‘We have a lot of work to do. Running the background, history and legality of these weapons is going to require a tremendous amount of time.